NOTE: Before purchasing, check with your instructor to ensure you select the correct ISBN. Several versions of Pearson's MyLab & Mastering products exist for each title, and registrations are not transferable. To register for and use Pearson's MyLab & Mastering products, you may also need a Course ID, which your instructor will provide. Used books, rentals, and purchases made outside of Pearson If purchasing or renting from companies other than Pearson, the access codes for Pearson's MyLab & Mastering products may not be included, may be incorrect, or may be previously redeemed. Check with the seller before completing your purchase. 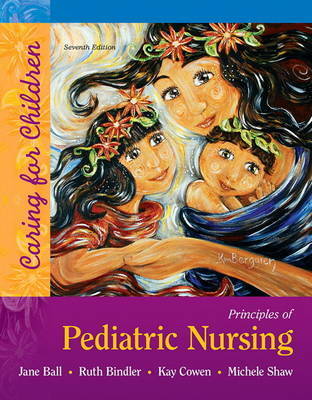 For pediatric nursing courses in associate and baccalaureate degree programs. Help readers learn to think like nurses and visualize how to care for children To prepare today's students to begin thinking and acting like nurses, Principles of Pediatric Nursing, Seventh Edition presents a foundation of core pediatric nursing principles with an emphasis on growth and development, family-centered care, and health promotion and maintenance. Nursing students often bring an Adult Health mindset to Pediatric Nursing, which can obscure the special considerations needed to effectively care for children. Principles of Pediatric Nursing helps students visualize how to care for children and understand the ways caring for pediatric patients is similar to, and different from, adult patients. Also available with MyNursingLab MyNursingLab is an online self-study and class preparation program designed to engage students and improve results. Its personalized learning path helps students think like nurses as they move beyond memorization to true understanding through application.